Whether starting with a new puppy or starting again with an adult dog, this folding double-door metal dog crate cuts housebreaking time in half and reduces behavioral problems. The exceptionally versatile unit features a divider panel that allows for adjusting the length of the living area. Keeping the living space small enough reduces the chance of the puppy eliminating in one end and sleeping in the other. Choose the size of crate that the dog will need when it reaches its full adult size, as the divider can be adjusted as the puppy grows. For easy placement in an automobile or in the corner of a room, the dog crate also comes equipped with convenient double doors, which allow both side and front access. Other highlights include safe and secure slide-bolt latches, a durable satin-black electro-coat finish, 1-1/2-by-5-7/8-inch mesh, rounded corners, and two plastic handles for carrying. The unit easily sets up and folds down to a portable size for suitcase-style carrying, and an ABS-composite plastic pan for easy clean up comes included. 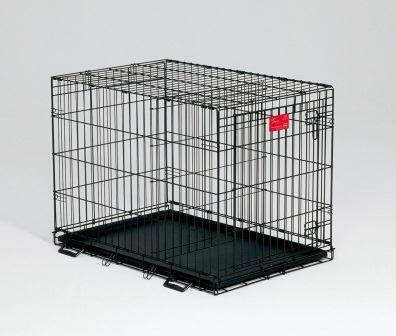 The dog crate measures 36 by 24 by 27 inches and carries a one-year limited warranty. LifeStages® single-door and double door dog crates by MidWest Homes for Pets® are designed completely around the safety, security, and comfort of your dog. LifeStages® crates set up easily in seconds, do not require tools, and can be assembled by almost anyone. Features include safe and secure slide-bolt latches, rounded corners, a durable satin-black Electro-Coat finish, and a removable, washable plastic pan for easy cleanup in the event of an accident. 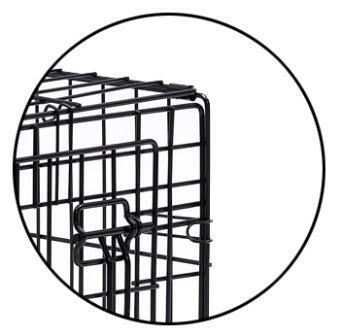 LifeStages® crates also come with a free divider panel for use while your puppy is growing. Simply choose the size of crate that your dog will need when it reaches its full adult size. The divider panel will allow you to adjust the length of the living area while your puppy grows, keeping the living space small enough to reduce the chance of your puppy eliminating in one end and sleeping in the other. LifeStages® crates easily fold down to a portable size for suitcase-style carrying and include plastic carrying handles to move the folded crate from one location to another comfortably. LifeStages® carry a one-year limited warranty and are available in six sizes: 22in, 24in, 30in, 36in, 42in, and 48in.